MWC Barcelona runs from 25 – 28 February at Barcelona’s Fira Gran Via. Come and meet the ChipCraft team at the GSA stand is located at Hall 8.0, Stand 8.0H15. 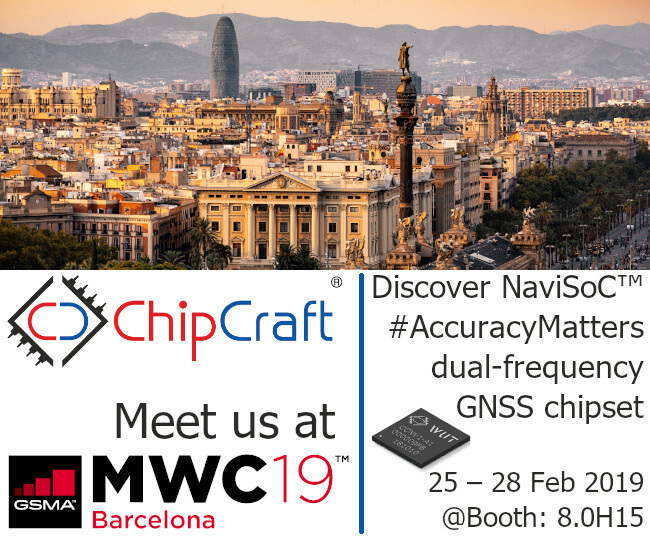 NaviSoC single-chip all-in-one solution, is a miniature GNSS receiver able to bring high precision and reliability for mass-market users and applications. It contains GNSS receiver equipped with rich of peripherals 32-bit RISC application microcontroller integrated with embedded Flash. It is provided with dedicated IDE with SDK making the user application development straightforward. This feature differs NaviSoC from other GNSS receivers and can be especially important for IoT application and autonomous systems. This kind of product is so far unachievable on the market and could be market enabler for future GNSS user segment and drive automation & autonomy of IoT devices to the next level.